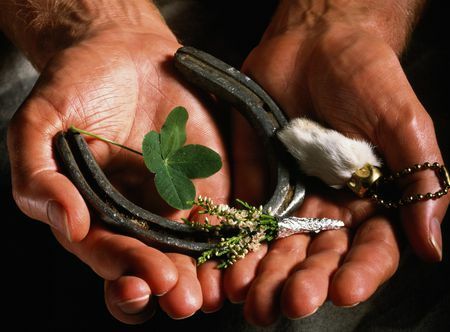 Good luck charms are often things we hold very dear to us for a whole lifetime. They are items of clothing and jewellery, sometimes toys and teddy bears that have been with us since we were born or arrived slightly later on in life. They provide us with comfort and confidence, which begs the question: why would anyone want to get rid of them? Well, the answer is, as you’d expect, rather complex. For around five years I have had two good luck charms. Two necklaces that I have worn every day in the belief that they bring me luck and somehow protect me from bad things. I never realised that my wearing of these necklaces had become so compulsive that when I lost the charm off of one of them not too long before my exams in June, I genuinely got a bit panicked. I worried that maybe this would mean I would fail, or at least perform badly. And I worried that I should really be looking for it instead of revising. Anyway, one night I was lying in bed and I felt the charm with my foot. I recovered it and placed it back on its chain where it belonged. I wore my necklaces throughout my exams and on other important occasions. After results day, however, I felt that they weren’t all too necessary anymore. Because there had increasingly been days when I didn’t wear them and nothing bad happened. Getting rid of my good luck charms has been a gradual process, but one that I feel is necessary. You can’t hold on to inanimate objects and expect them to bring you luck. It just doesn’t work that way. You have to believe in yourself and believe that, in fact, it’s you who brings yourself your own luck. How? By working for it. After all, it seems ludicrous to believe that wearing two necklaces has gotten me into university, right? So as I embark on this next chapter of life at university, I’m saying goodbye to my two good luck charms that have been with me almost every day for the past five years. I’m leaving those years behind now, so it’s time I left the necklaces too. Never get attached to good luck charms. They can become objects that haunt you rather than help you. And, in my case, means you wear the same necklaces every day. Sometimes a bit of diversity and change is actually welcome.